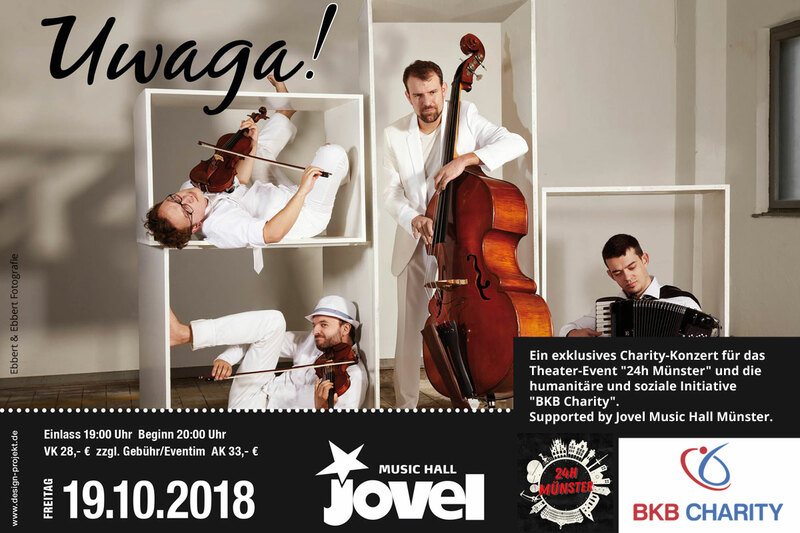 Thanks to the fabulous support of the Jovel Music Hall, crossover band UWAGA! is holding a charity concert for the “24h Münster” theatre event and the humanitarian and social initiative “BKB Charity”. A virtuoso classical violinist with a love of Eastern European gypsy music, a jazz fiddle player with punk rock experience, a superb improvising accordionist with a Balkan sound in his blood, and a bassist that feels just as at home in a symphony orchestra as in a jazz band or funk band – those are the members of the crossover band UWAGA! Reckless creativity, dizzying tempos, a thrilling performance, and the improper, almost audacious handling of classical instruments and cultural heritage – the range within which Christoph König, Maurice Maurer, Miroslav Nisic and Matthias Hacker move is rather appropriately delineated. With a refreshing mix of excessive musicality and stylistic impartiality, UWAGA! celebrates success around the world: Be it in the Konzerthaus Dortmund, at the expo in Shanghai, or in the Grand Hall of the St. Petersburg Philharmonic Orchestra. BKB Charity would like to warmly thank all of those involved in this unique charity concert. Jovel Music Hall is set to shake!